11:00 AM – Press conference just started. Tom Malone is speaking. 11:02 AM – Preview of FLO TV. A IPTV streaming service. Getting good content and channels was first priority. It happened. 11:04 AM – New hardware piece announcement. It’s for cars. Companies have to install it into their vehicles. 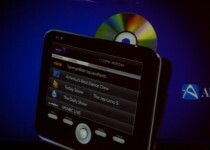 It allows the TV service platform to be delivered to cars. 11:06 AM – Mainly focusing on in-car technologies. However, this year talking about Flo TV’s PTV. It’s a handheld portable version. It allows watching that TV content in your hands. 11:07 AM – Some kid apparently asked for a Flo TV (PTV) when Obama was asking children what they want for Christmas. Audiovox seems damn excited about the free PR. However, I don’t think Obama knows what it was considering he wasn’t too familiar with the Nintendo DS. 11:09 AM – Back to rear seat entertainment for FLO TV. Want to bring that to a larger mass market. 11:10 AM – Portable DVD players are fairly boring. People don’t use it that often. 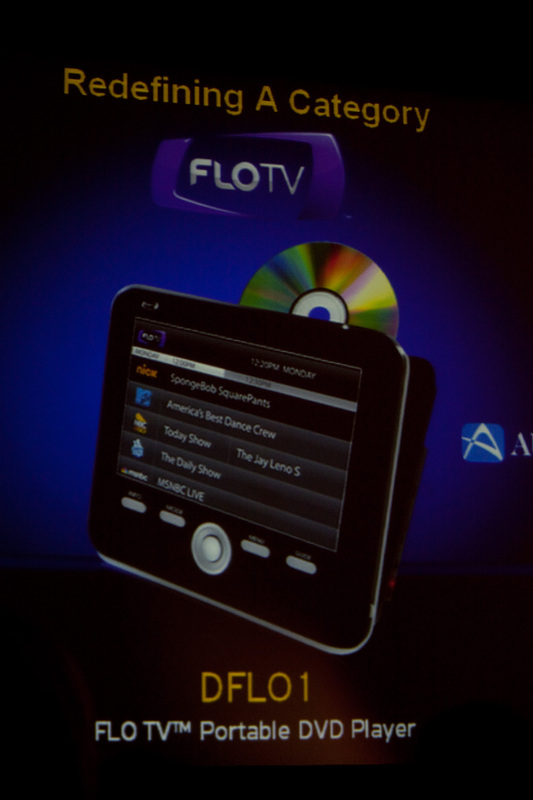 Now Audiovox created a portable DVD player with FLO TV built in. They are trying to appeal to a new market. 11:11 AM – Partnership with PlayStation 2. Audiovox built a in-car version of the PS2 for back seats. Everything built in. Audio goes through car. TV screen is overhead. And controllers are same PS2 controllers. Seems awesome, but didn’t the PS3 come out? We want HD and Blu-Ray in cars! 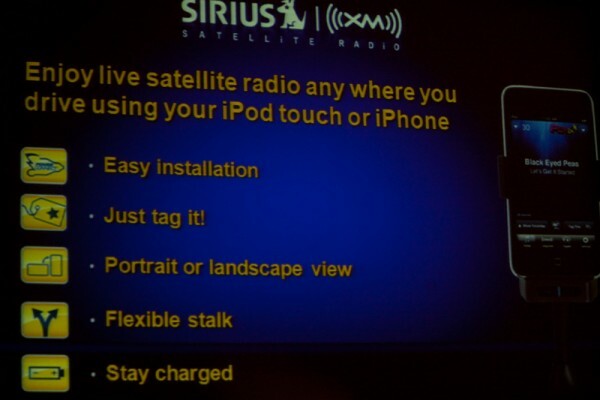 11:13 AM – Sirius dock for iPhone for cars. Doesn’t seem to interesting. Just an FM transmitter for the car with 3G music streaming. Cool? 11:14 AM – Digital Photo Frames. Nothing special. Just has a tool to auto generate photo albums. Has a music box playback and movie playback. One again, this isn’t too interesting. These have already been around. There’s plenty of WiFi models, this doesn’t even have it. 11:15 AM – Only cool photo frame technology is the one without a frame. Just a display. You have to use your own frame. It’s the size of a standard sized photo, just put your own frame over it. Looks like a a very minimal and thin design. 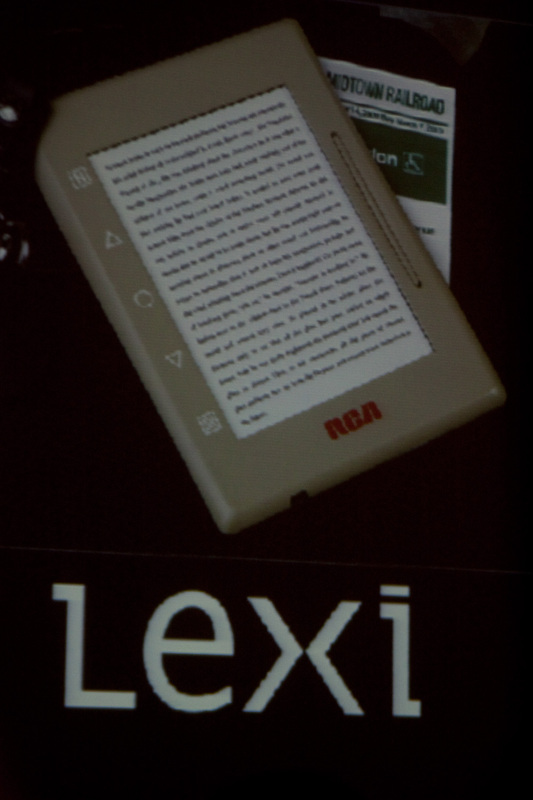 11:16 AM – eReader announced. 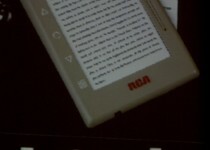 Can’t compete with Amazon Kindle and B&N Nook. So they decided to partner with Barnes and Noble. All their content will be available through their item. Biggest difference: it doesn’t have WiFi or 3G. You need to connect to computer for new content. 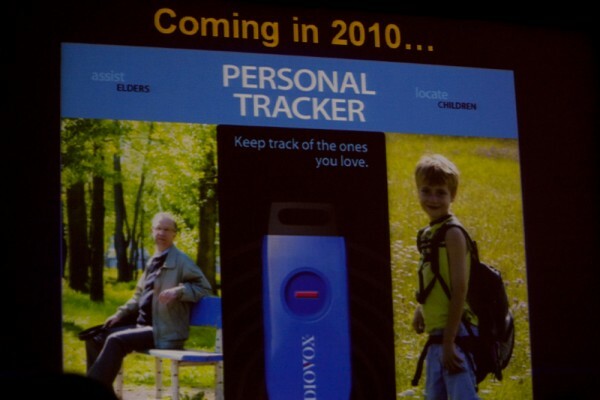 11:18 AM – Personal GPS tracker for children. Drop a little flash-drive sized gizmo into child’s backpack. It tracks it through a web interface. Can setup virtual boundaries and notifications. 11:19 AM – Another speaker takes the stage. He’s from the accessories department. Talking about many items including Universal Remotes, Networking, etc. 11:20 AM – Voice controlling remote announced. Can control your home theater with voice commands. Just need to speak to it. Sounds great, but how does this work exactly. If the sound in your theater is on, won’t it drow out your voice? This sounds impractical! 11:23 AM – New applications for home control through Blackberry. Can open garage, control TV, and audio. Apparently also works with iPhone with same features. Cost about $69 for RIM Blackberry and $79 or Apple iPhone. Also have a technology to use a Blackberry to control music playing on an iPhone or iPod Touch. Who has both? Seriously? 11:24 AM – A wireless speaker system for homes. Have a single transmitter technology. Just play music from one place, it will broadcast to all the places in a home. For outdoors, they have a weatherproof model. Can survive outdoors all year. 11:30 AM – New Powerline technology to provide an internet connection to parts of the home. I don’t know why we can’t just go to WiFi yet. However, I’m sure there’s a small market of people who have brick or concrete walls that WiFi can’t penetrate. 11:32 AM – Wireless HDMI transmitter and receiver. We’ve got to see how well it works and from how far.